government department in 1945. Beiler also acted as consultant to radio station WCKT, providing election predictions and analyses of returns, and also served as a panelist for the Florida Forum. Research" published in The Polls and Public Opinions, and several of Beiler's articles appear in journals and other publications. The Ross Beiler papers include published studies and research files on politics in south Florida, 1958-68. The papers, which include polls, articles and papers, newspaper clippings, political advertisements, correspondence, course outlines, and other materials, consist of five series. 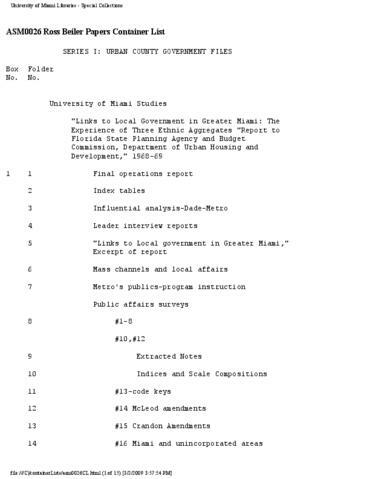 SERIES I: URBAN COUNTY GOVERNMENT FILES contains University of Miami studies and research files. Polls, questionnaires, notes, and a published report pertain to a 1968 federally funded study of ethnic groups in south Florida and their interaction with local government. Beiler collected data from 6 persons in 110 white, 43 black and 43 Latin neighborhoods and reported to the Florida State Planning Agency and Budget Commission in 1969.
second study appearing in SERIES I. The 1958 interdisciplinary study on the "The Creation of Metropolitan Government in Greater Miami" explores the forces affecting the demand for metropolitan government in Miami, centralizing and decentralizing forces affecting its implementation, and the impact of metro decisions and administration on the economy and on socio-political relations. The papers include project outlines and proposals, questionnaires, results and analysis of polls, newspaper clippings, notes and reports. Files in this series also relate to a 1968 study on urban unrest conducted by the University of Miami and eight other universities, supported by the Department of Housing and Urban Development. Memos and correspondence, a project proposal and drafts of Beiler's report on the seminar detail the study of "Psychosocial Dynamics in Miami." guide and evaluation of research facilities in Greater Miami. Materials relating to a 1965 University "Self Study" include a faculty questionnaire, tables of responses, and a final summary, as well as a student questionnaire and code key. Research files in SERIES I include bibliographies, papers, articles, and newspaper clippings dealing with general political and social issues such as African American sociology, urban politics, Mass Society, violence and other topics. Files also concern local government including current Metro (Metropolitan Dade County government) administration and general attitudes towards metropolitan government, Miami city government, Miami Beach, local organizations, community leaders, and water and land management. SERIES II: WRITINGS includes several of Beiler's articles on politics, media, and metropolitan government in greater Miami. and Republican party national conventions for the years 1956, 1960, 1968 and 1972. Course outlines, articles and other materials from government courses appear in SERIES IV: TEACHING MATERIALS. SERIES V: CORRESPONDENCE relates to the Better Government Association, headed by University of Miami professor Thomas Wood. Ross Beiler Papers Finding Aid© 1994 University of Miami. All rights reserved. Permission to publish materials must be obtained in writing from the Head of Special Collections.